Give a new look for your commercial building through painting! No matter if you are owner of a restaurant, a small boutique, or a department store: you need to keep your building nice and well-maintained to keep on attracting customers! Here are a few points not to be neglected as far as commercial painting goes. Cornice painting is an aspect of commercial painting that is often neglected. As they are placed at heights, cornices tend to be forgotten. But they are still in our field of vision when looked at from the other side of the street. 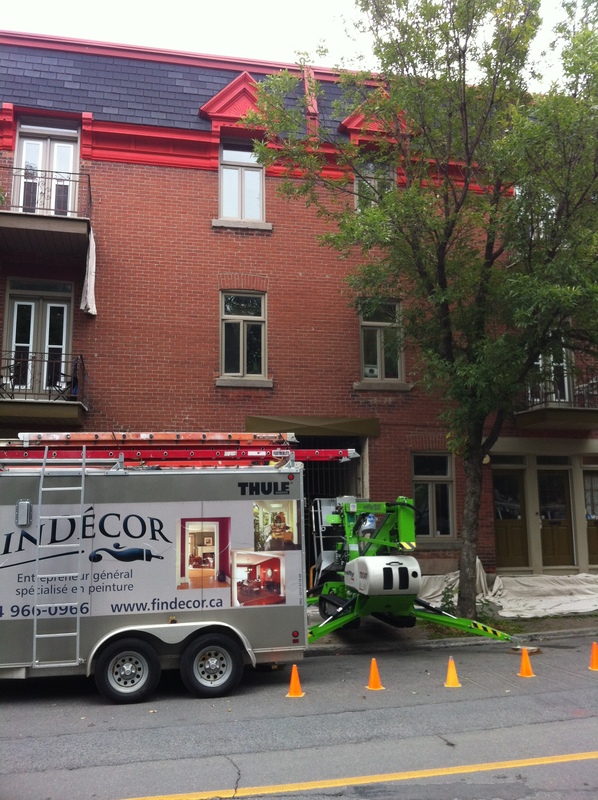 Thus, restoring and painting the cornices will help your store preserving a nice appearance. As the name of your company is on your store sign, your company will look bad if your sign is neglected, if there is a letter missing, if the neon is defective, or if there is paint missing. Do not hesitate in investing in your logo and store sign: after all, the image of your company depends on it! No matter if your exterior siding is made of bricks, concrete, aluminum, vinyl or wood, take care of it! It is now possible to paint just any surface: you can find products to dye your bricks, varnish your wood, and to paint anything, even plastic! Also think about having an anti-corrosion treatment for your wrought iron stairs and for your lintels, have your antique doors restored, and have your metal doors painted. Your business will definitely look better that way! We do recommend the store owners to refresh their interior paint each 5 years so that they will follow the color trends. This will give a new look to your store or restaurant, and the customers will want to go in. Ask advice to your painter for the choice of colors. Don’t neglect to paint the ceiling! Make sure you fill in all the cracks and holes with plaster and add a coat of sealant before applying paint. This way, you won’t have to pick up the pieces of gypsum on the floor because your roof is leaking! Classical color for the ceiling is always white, but some restaurant owners like to ask for artist painters to paint their ceilings: it’s original and inviting! Obviously, dirty windows will keep the prospects away. 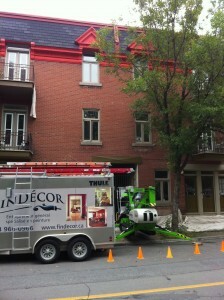 Findécor Inc. is now owner of a lift for window cleaning and painting at heights.